What do you need to buy for your kids? Clothes? A new backpack? Lunch snacks? Speaking of lunch snacks, remember these? Yup, they're still around! You can find up to 70 participating products at Walmart that have these Box Tops for Education. It's simple. Just clip these box tops off and donate them to your local school. In turn, your school of choice earns CASH to use for their school. It's not just pocket change, folks. Last year, schools got $49 million from Box Tops! If you shop online, you can earn eBox Tops for your school. Did you know if you join the online Box Tops program, you can enter to earn BONUS box tops for your school, get coupons for your favorite products and find recipes that use Box Top products? And to get you started, you can win a $25 gift card to Walmart!! 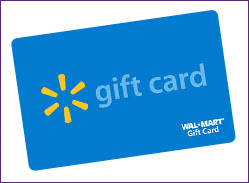 The information and $25 gift card to Walmart has been provided by Walmart and General Mills through MyBlogSpark. I received a $25 Walmart gift card to enjoy through this promotion. Giveaway is open to all my US readers and will close July 29, 2011 at midnight, MST. Winning comment will be selected by Random.org and posted here on this blog. I don't even want to know how much a scientific calculator will cost! But, yup that's what we will need along with all the folders,binders, pencils, etc. I have been buying clothes for my daughter all summer long so other than undies, shoes and socks, she needs school supplies. My son is another story. He needs clothes and shoes to go along with school supplies and some sort of fancy math calculator. I can't believe how fast this summer is flying by! School supplies, football cleats, clothes, lunch money, school fees. My daughter is starting preschool in the fall; she needs her first ever backpack! We need glue sticks and pencils! I like Walmart on FB with my username Mary Happymommy. I don't have students of my own, but I have 120 new ones every year! My students need drawing pens. We run out of them constantly and Walmart has them cheap! I am also follower on twitter and retweeted you. My child needs pens and folders for school. I'd get backpacks, notebooks, crayons and glue sticks. We will be looking for a new back pack and lunch bag! We need a backpack, markers, colored pencils. we find out Tueday what the kiddo needs for school! I think he needs a new backpack....hubby is not so sure. I "like" Wal-mart on Fb too! My daughter needs a backpack and a couple of clothing items. Believe it or not...I DO follow Wal-Mart on Facebook...I had for years! lunch meat, bread, & fresh produce. I'm hoping to do a better job w/ sack lunches. I need all kings of paper, pens, pencils, binders, dividers.. ECT!! My grandson needs a backpack. It'll be school time before we know it. needs new school clothes we are moving and will no longer be wearing uniforms....ugh!!!! I love uniforms! Binders, notebooks, locker shelves, pencils, ereasers, shoes, kleenex, wipes, etc. etc. etc.....the list could never end. Who doesn't need a WalMart gift card?? My daughter needs new notebooks, paper, dividers and pencils! Would love to win the giftcard! i will buy my kids school clothes and they really need some new sneakers, notebooks, and backpacks. my daughter needs a backpack. I like WalMart on FB! I follow WalMart on Twitter! No young ones yet, but I'm heading back to complete my med tech certification and I desperately need some expensive books! I'm a Walmart FB fan.. have been for a while! My son could really use a new, more haeavy-duty backpack. Thanks for the chance to win!